I’m too proud to go after the tax breaks. But… I can haz Ark Park! This was Robin T’s idea. I’m not sure how it happened but we were laughing about Ken Ham’s silly creation museum and she said “We should do our own.” We started with an Adam and Eve scene then went to town with the Ark, and a creche. I’ll post the creche for Xmas. We had good days doing these – lots of glue fumes and giggling. It’s pretty accurate, too – just like the real “Noah” I had to bandsaw the T-Rex below the waist to get him to fit into the ship. That is what happened to the T-Rexes, don’t you know? Note to all photographers: this is supposed to be bad photography. So please don’t zing me for my lighting. The googly eyes are a nice touch. We did it back in 2009. I think I posted a link to it back on Pharyngula. But now I haz microphone and can use it tax-free to propagate my vision of events! I love when apex predators get their shwerve on! Oh how cute! There are going to be more lions soon! :-) Funny how no one ever thinks of that. Most people aren’t aware of things like the gestation period for a goat, for example. (148-152 days. PLENTY of time during that year on the ark for new kids. And how many other animals???) I don’t think most people are aware that an adult elephant eats about 700 pounds of food A DAY. For just the two elephants, that would be 498,400 pounds of food, supposing exactly one year on the ark. 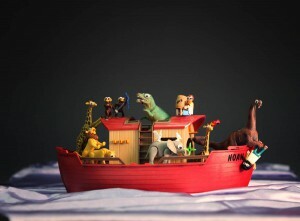 I think your ark might sink… And just where are you going to store all that, pray tell? And how are you going to feed all the extra creatures that keep appearing? As a child, this bugged the crap out of me. It’s nice to finally see this subject dealt with *seriously*. Given the date, it wasn’t too hard to find PZ’s Sb posting of this. Oh! A thousand pardons for abusing your eyeballs again. I’m going to use this as an anchor for an entire thread of my wretched photographs. So, you have been forewarned! !